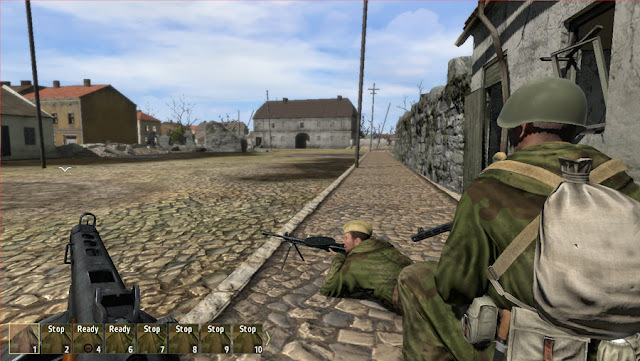 This is a standalone infantry combat simulation based in the ArmA 2 engine that puts the player in the boots of Soviet and German soldiers in a portion of the Eastern Front of WWII. The player can also fly aircraft and fight from tanks but those gigs should not be expected to offer simulation quality time. One of the biggest ironies of the current huge diversity in computer games is the almost universal acceptance that there are just a handful of gaming genres where you can bin everything published. When it comes to the so-called “first person shooters genre”, the specialized press and the market have settled for standards which are about revenues in the hundred millions, Hollywood-style storylines and a formulaic gameplay experience. It is all about getting past checkpoints (don’t you dare making a decision on your own, follow the bloody waypoint), belated rewards (don’t get bored yet, you are just 45 points from unlocking a flashlight) and great cut scenes to compensate for the lack of virtue of the virtual world in suspending the gamer’s disbelief. Millions of gamers are happy to pay prime dollar to be spoon-fed the same applesauce over and over again, and I have nothing against these gamers or the mainstream industry itself. It’s just that I read many reviews of Iron Front in the mainstream press, and they are measuring it with the same old rusty metric tape. Although I systematically get my rear end handed to me by my teenage son in the “Calls” and “Battlefields”, I’m not bitter about my untimely virtual deaths or my chronic lack of reflexes in mainstream shooters. Well, maybe a little bitter. But the last paragraph is a necessary disclosure about how my definition of having fun while running with guns collides with the mainstream one. You are advised and continue reading at your own risk. That being said, let’s bring in the ArmA 2 engine from which Iron Front was made. This engine is a bit of a bit of a cult among first person shooters (here defined as in the mainstream sense). No other engine can unchain both deep hate and love, sometimes even in the same person in a short period of time. On one hand, it is moody, a hardware hog and a frequent immersion killer. Your virtual character has to skirt around the most ridiculously small obstacles and will drive vehicles like if it was under the influence of alcohol. On the other hand is one of the most (if not the best) versatile tactical sandbox for combat simulation. Are you feeling like blowing up some stuff without too much involvement? Somebody has certainly made a single-player mission for your needs, or there are plenty of servers around to gun and run at your pleasure. If nothing helps your appetite for easy targets, there is a mission editor (one of the best scenario editors out there) that will allow you to edit and play your scenario without too much fuss. Maybe you are feeling more brave and want to brush up some serious tactical skills? Yeah, ArmA 2 can do that. From just a band of guys that just get together for a cooperative match to fully drilled groups of organized "clans" (to borrow from the mainstream mambo jambo) that follow a chain of command and real battle drill. The mission editor can be used to throw some units and waypoints on a map for quick fun or (in the hands of an experienced user) can be used to simulate complex events and behaviors for the virtual units. 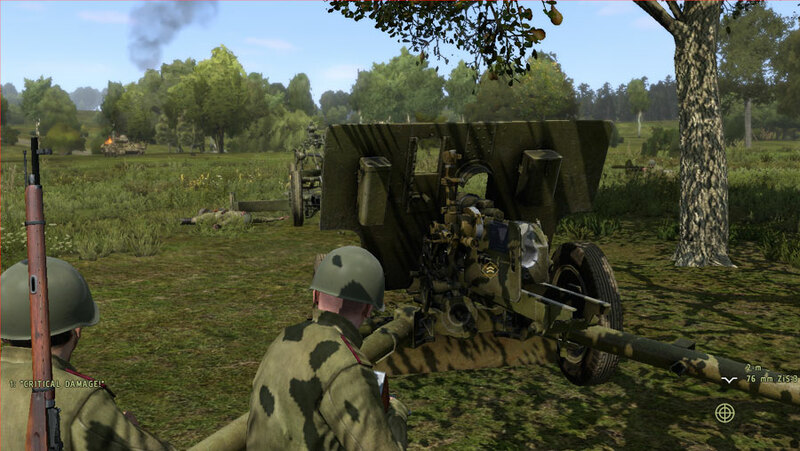 Iron Front it is a World War II ArmA 2 and it shows all great achievements and pitfalls of the engine. It is perplexing that the developers of Iron Front have not made use of hindsight to avoid areas where the ArmA 2 engine doesn’t fare well. One example is the use of long cutscenes that make use of animations. These animations are too generic to cover the complexities of human interaction. I have travelled in a truck with fellow AI soldiers who were all looking at me and moving their lips while actually only one of them was actually talking. In the training camp, where everybody was running from station to station like in the middle of an air raid. Other example is the profuse use of scripts and triggers in the single player missions and campaign. Although the ArmA 2 engine features a very powerful and customizable virtual world, it doesn’t cope very well when one context-rich tactical situation is put on top of the other. In one mission, my unarmored vehicle driver decided to go through a road blocked with emplaced obstacles while we were bombarded by a mortar barrage. A few minutes later my officer pulled back towards friendly lines without telling me a word, leaving me with an incomplete mission to execute on my own. The canned single player scenarios are not the best selling point of Iron Front. Given the well-known bright and sore spots of the ArmA 2 engine, it feels like a self-inflicted shot fired from the “it-must-have-this” gun that the mainstream market is seemingly handling across the board. Iron Front packs some features that I’ve never seen in previous and current ArmA 2 offerings: the ability to pushing guns around and to hitch these onto trucks or halftracks. Pushing and hitching AT guns may not sound as thrilling groundbreaking features, but the player who read his WWII history will easily recognize that for Iron Front’s historical time frame (Germany over stretched beyond recognition in a defensive battle, short on armor to stop the Russian onslaught) they add a lot to the tactical net worth of the game. Both features didn’t work very well in the original release but work fine after the current patch. AT guns also feature working optics in which the player has to estimate the range to the target and dial it into the aiming reticle. 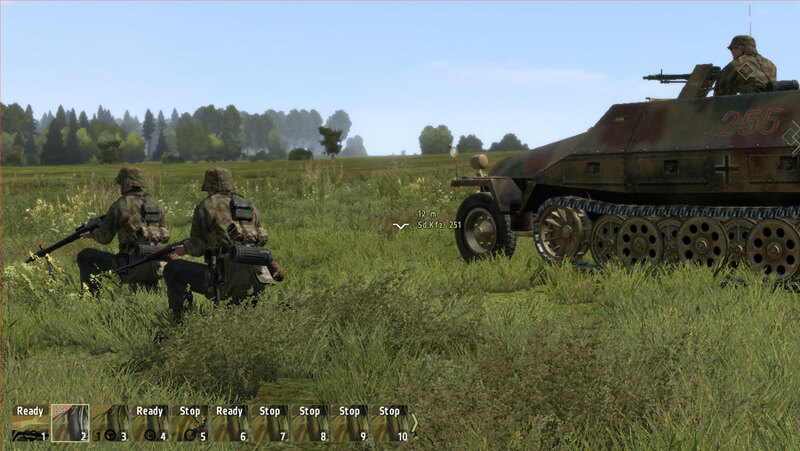 Other features in Iron Front are an evolution from the original ArmA 2, like the armor damage modeling. Besides animations of tank’s track armor skirts falling off after impact, there is an improvement from the generic ArmA 2 kill from “hit accumulation”. Right now, the type of AT shell and the point of impact on the tank (front, side, rear) have different and more believable effects. 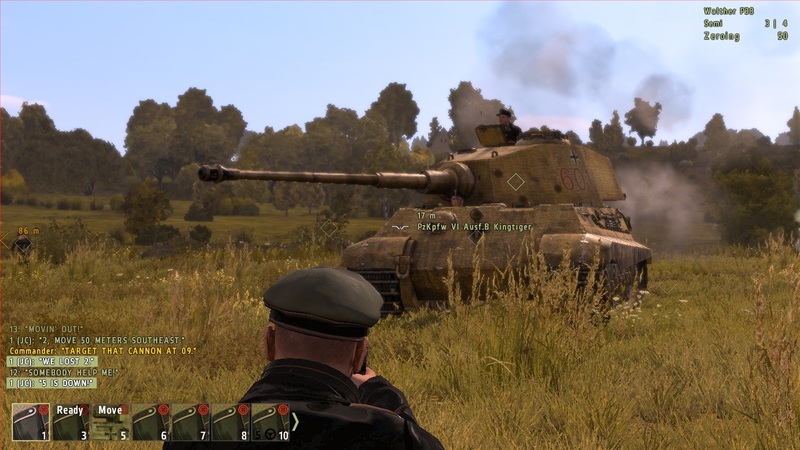 Be advised that the modeling of armor penetration is not up to medium or high fidelity standards: I’ve ran some tests with tanks and anti-tank guns and the results were a bit disappointing compared to more or less accepted armor data available in the internet. In one test the results strongly suggested that (contrary to the before-mentioned available data) the range of fire didn’t matter and I could kill the tank from 200 to 1,200 meters as long as I was firing on the same spot. 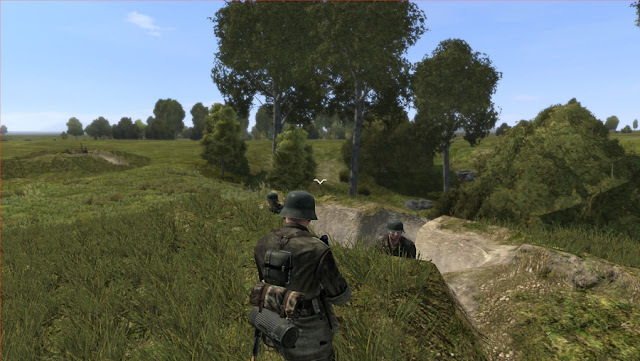 Iron Front plays different that ArmA 2 and the differences if game play match very well with the differences between modern and WWII tactical combat. The tactical pace is slower and the engagement distances are shorter. Effective suppression works less efficient with squad-borne weapons and assaults have to be delivered quite close. It all boils down to the different weaponry and target acquisition aids of WWII. You better get your tactical act together because you are in for a shock when you drop into Iron Front armed with an action bolt rifle that you aim with an iron sight. I’ve seen more than one ArmA 2 hot rod dropping by an online match and leave frustrated after he couldn’t target an enemy some 150 meters ahead. Other guy, likely too spoiled by Javelins and AT-4s, protested his mission of taking out a T-34 with a panzerschreck as “something suicidal”. The WWII-oriented players will be at ease with Iron Front because the tactics and procedures needed to survive and make a difference in the battlefield can be read in historical accounts and in battle drills of the 1940s. In my case, a bad shot with un-achieved ambitions of tactical command, Iron Front sometimes feels like playing a small scale wargame while being shot at. It can’t go without mention that the MG42 is the most awesome machine gun to ever grace my virtual trigger finger. One weapon system that feels a bit too similar to ArmA 2 is the mortar: it drops rounds with laser-precision and the effects of it on infantry are too devastating. Armor combat, even when some shell effects noted above are still off from full realism standards, unfolds surprisingly good. Not good enough to claim a place in the ever dwindling menu of WWII armor simulations but at least it is believeable and forces you to use good tactics to accomplish your mission. 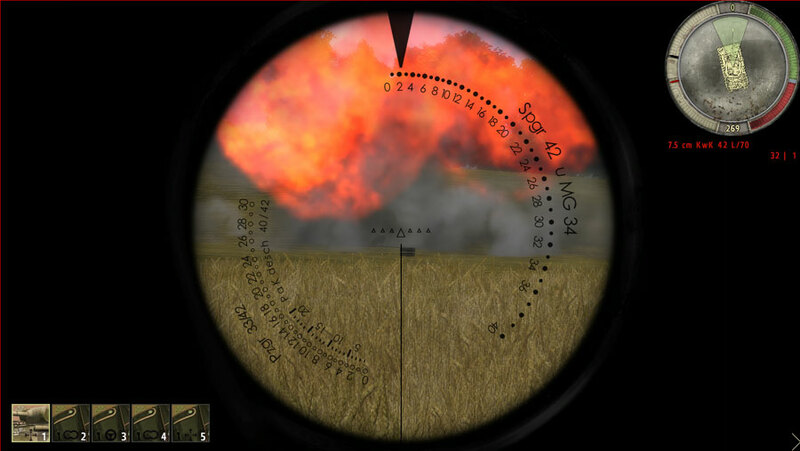 I have the suspicion that in this case the good implementation of the tanks’ target acquisition optics compensates for what Iron Front is missing in ballistics. 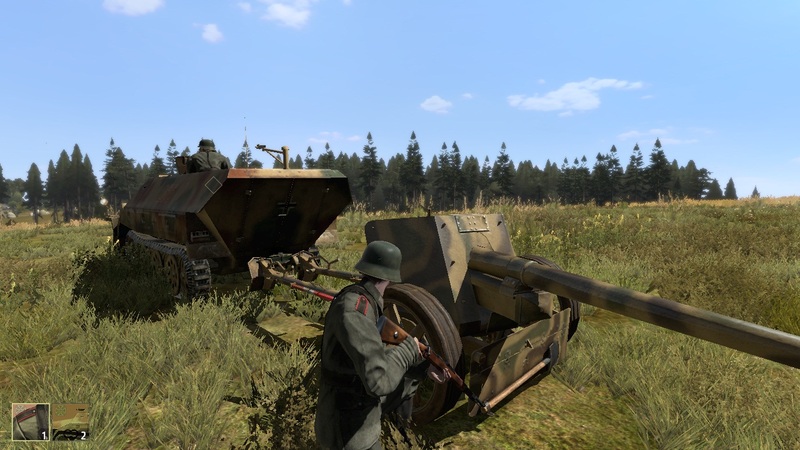 Iron Front multiplayer is as good as the people you find in the server you just joined. You can get a fun gun and run or a more sensible tactical game. 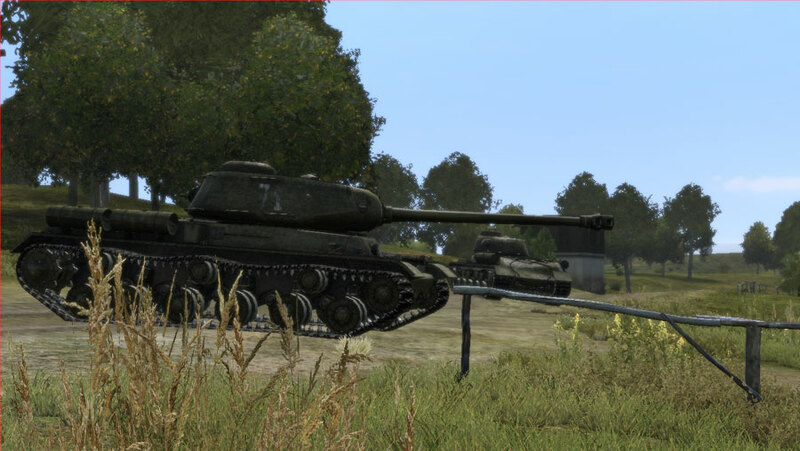 There are not so many servers to join (at least less than ArmA 2 servers), but there are sufficient choices. Many missions loaded in the servers are more or less a full port of the ones in ArmA 2. I try to limit myself to small scenarios with people I know, like the fellows at SimHQ.com. I occasionally join some of the more crowded servers and sometimes get a good game when at least some of the players are tactically oriented. I remember one session where the opposite side was forcing a crossing across a river, using mortars and aircraft to suppress our defensive positions. It was fantastic to see all the confusion among my fellow players and the explosions from our thinly manned counterattack line of departure . The climax was when the enemy crossed the river with unsupported armor and we harassed those poor hulls from the outgrown vegetation with just hand held anti tank weapons. The list of equipment available in Iron Front is extensive but limited to some of the equipment used in the Eastern Front during 1944. Tanks include the Tiger II Ausf. B, Panzer IV Ausf. H, Panther Ausf. A, Stug III, T-34 (76 and 85), JS-2, JS-122 and SU-85. Transport vehicles include the Sdkfz. (251/1 and Flak 38 variants), Kubelwagen, Opel trucks (transport, medic, fuel and repair variants), ZIS-5, Studebaker US6, Willys Jeep and the M3 Scout truck. 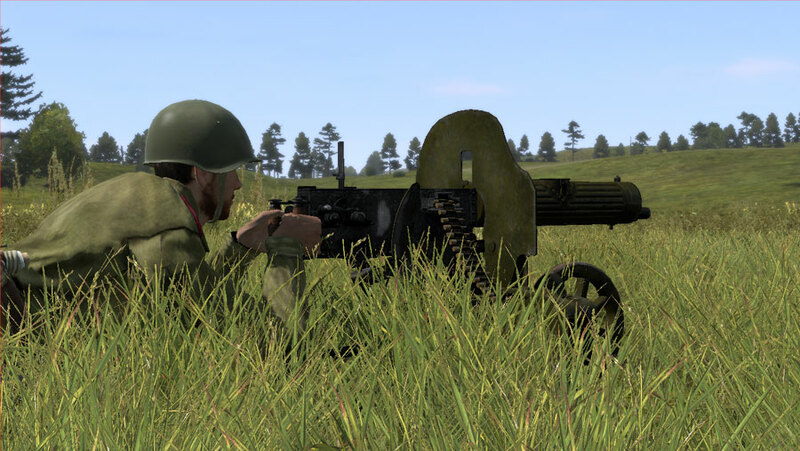 Fire support weapons and guns include the MG42 (static and portable versions), 34 mm mortar, Flak 30/38/40s, Pak 40 (I think is the 75 mm version), the venerable PM M1910 Maxim gun, 82 mm mortars (Russian) and the 40 mm Bofors AA gun. There are for maps: Stasznow (Poland, 15 x 15Km), Baranow (Poland, 8 x 8Km), Panovo (Ukraine, 5 x 5 km) and Ivachev (Ukraine, 1 x 1 km). If you never played ArmA 2, be aware that Iron Front can be a serious resource hog. 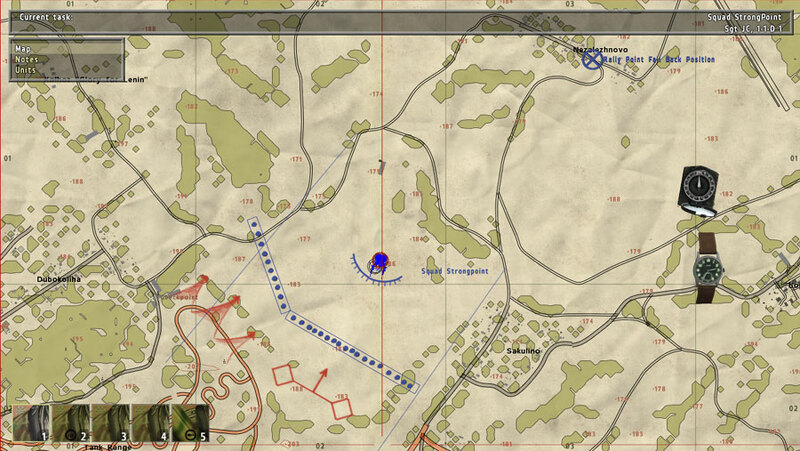 A good measure of the capabilities of your system to play Iron Front is how good ArmA 2 plays on it. There is a free, scaled down version of ArmA 2 that can be used to get an idea how Iron Front will play in your computer. SCORE = B+. A solid WWII tactical combat simulation in line with the well established tradition of the ArmA 2 series. Good looking graphics, great tactical gameplay, enormous versatility for user-generated content, good custom-tailored changes to the base game engine and steady developer’s support. Could have benefited from not trying so hard to be on par with mainstream first person shooters and from simpler, functional single player missions with more historical emphasis. Recommended for ArmA 2, WWII tactical gaming, and other fans that are willing to veer off the beaten path of mainstream shooters and invest some time getting acquainted to the incredibly high versatility of this game engine. Looks interesting.. but gawd how I hate first person shooters. I'm not convinced that it would be a better tactical simulator than CM is. Looks incredible though. BTW, I didn't like ArmA 2, as controls are too unresponsive. It really doesn't matter when you're out in the open, but urban CQC is just unbearable and frustrating. Great review JC: It is nice to read an unbiased and completely fair analysis instead of the rinse and repeat comparisons to BFX and CODX. Might wanna adjust the "enormous versatility for user-generated content", statement mate. It's not accurate, at least where modding in IF is concerned. Hi Bil, I think that ArmA's focus is in small unit tactics. I wish CM had the powerful scripting/triggers system that ArmA has. Hi Michael and thank you. I am glad you like the few reviews I posted. I will have more of them coming. The main obstacle is free time. Hi Ranger and thank you. Hi Bryan. I don't know. The possibilities are still enormous compared to other tactical shooters in the market. Besides, it would be like "mod the mod". Also, sometimes I feel like we need less variety of textured decals and more stuff that makes a difference in gameplay. Most of the scripting stuff that I know of from ArmA still works fine in IF. One of the reasons the player-base plummeted is due to modding, or lack there of. The developers must approve and sign every mod via PBO. Else, it can't be utilized on any server. It isn't open to modding. It is in fact closed. I understand. But IF is using a license from BI. I wonder about the legal implications. It's not the licensing constraints. What it is is a business model, very much like the one used by EA in regards to BF3. They're more worries about DLC sales, and they don't want any cross modding projects that could put that in jeopardy. The devs and distributor have already stated as much. very much thanks for sharing this amazing high quality game.